The Holy Trinity jumps to our consciousness from the Red (the meaning of Colorado). 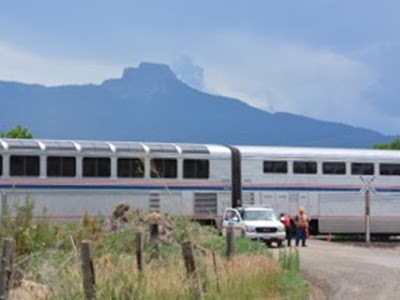 An Amtrak train crashed in to a 2005 Chrysler Town & Country in Colorado on Sunday, June 26, 2016. 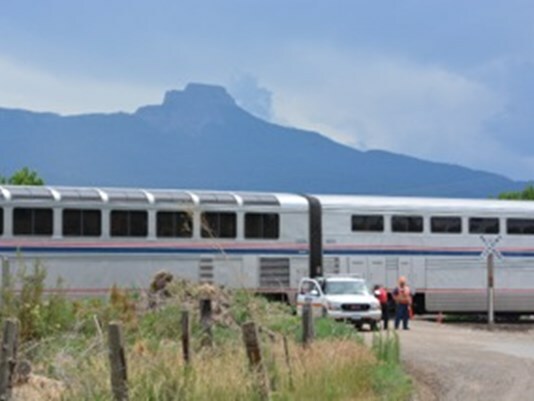 The van's right side was hit after it failed to yield the right of way to the train, Colorado State Patrol said in a news release. The driver and four passengers were killed. One occupant was airlifted to Denver Hospital with injuries police described as serious. Six people. Investigators say the crash happened on Las Animas County Road 32, around three miles north of Trinidad. 9NEWS sister station KOAA-TV reports the parents who died were Christina and Steve Miller. (Christina links to the "Christ" undercurrent here, of course.) Las Animas Road further plays into the religious theme: Las Animas means "the souls" or "the spirits," often referring to the dead in Purgatory. Their children, Abigail, Kathryn and Ellianna also passed away. Four-year-old Heidi Miller was the only survivor. No train passengers or crew members were hurt. Authorities said the van was not stopped on the railroad tracks. The crash happened about three miles north of Trinidad, Colorado. The town of Trinidad has had an underlying history linked to baseball and other sports. Trinidad was first explored by Spanish and Mexican traders, who liked its proximity to the Santa Fe Trail. It was founded in 1862 soon after coal was discovered in the region. This led to an influx of immigrants, eager to capitalize on this important natural resource. By the late 1860s, the town had about 1,200 residents. Trinidad was officially incorporated in 1876, just a few months before Colorado became a state. An important milestone for the town occurred in 1878, when the Atchison, Topeka and Santa Fe Railway reached Trinidad, making it easier for goods to be shipped from distant locations. In the 1880s, Trinidad became home to a number of well-known people, including Bat Masterson, who briefly served as the town's marshal in 1882. By 1900, the population of Trinidad had grown to 7,500. It was now home to two English-language newspapers, and one that was published in Spanish. In the early 1900s, Trinidad became nationally known for having the first woman sports editor of a newspaper, Ina Eloise Young. Her expertise was in baseball, and in 1908, she was the only woman sportswriter to cover the World Series. During the same period of time, Trinidad was also home to a popular semi-pro baseball team, which was briefly coached by Damon Runyon. Source. The Legends of the West...The Wild West's Trinity, all with ties to Trinidad, Colorado, however brief. The infamous Ludlow Massacre is also associated with Trinidad, Colorado. Many people died in the "massacre." Trinidad is a Spanish name directly related to the "Holy Trinity." Trinidad is the larger and more populated of the two major islands that make up the island nation of "The Republic of Trinidad and Tobago." Trinidad is the southernmost island in the Caribbean and lies just 11 km (6.8 mi) off the northeastern coast of Venezuela. The original name for the island in the native Arawak language is "Iëre," believed to mean "Land of the Hummingbird." Christopher Columbus renamed it "La Isla de la Trinidad" ("The Island of the Trinity"), fulfilling a vow he had made before setting out on his third voyage of exploration. Trinidad and Tobago is known for its Carnival and is considered to be the birthplace of the steelpan (steel drum) musical instrument, limbo dancing, and the musical styles of calypso, soca, and chutney. Source. 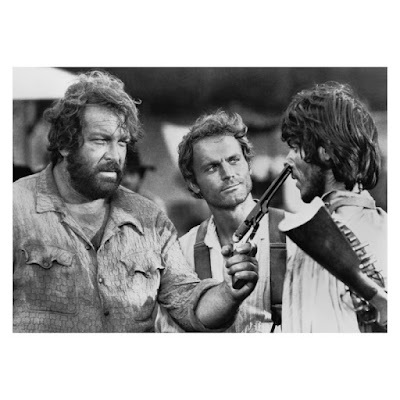 Italian actor, filmmaker Bud Spencer died at 86, on Monday, June 27, 2016. Often cast as a cowboy or policeman, one of Spencer's biggest successes included They Call Me Trinity, a parody of Spaghetti Western movies. For more on Tridents, see Symposium on Tridents, here. The peak in the Trinidad photo is Fishers Peak. I believe 19 to 26 miners, women, and children died in the "massacre", and 70 to 200 more in the aftermath, if you believe wikipedia. I used to work on the BNSF railroad at a site just south of the UMW monument, and have visited it several times. I believe 19-26 miners, women, and children perished in the "massacre", and 69-200 in the retaliatory aftermath, if you believe wikipedia. I used to work on bnsf railroad in area just south of the UMW monument, and have visited it several times. Most of the time, what appears in the MSM as synchronistic is the intentional manipulation of the public opinion. But this tragic story with its many threes I place it on the truly synchro-mystic side of coincidence. The accident occurred on Las Animas County Road 32. ANIMA from Latin, meaning mind or soul. A word used by Jung to describe a man's female side of his psyche. For a few years in the early 1880s Bat Masterson made Trinidad his home. In April of 1882, he and Luke Short met up with Wyatt Earp and his vendetta posse in Silver City, NM. They went by train to ABQ, then to Trinidad. From there Wyatt, Doc Holiday, and Warren Earp journeyed to Gunnison. In 1883 he lost his re-election bid as town marshal. He left town in May of that year. Going back to your 'trinity' - for a few days, the little town experienced the presence of Bat Masterson, Doc Holiday, and Wyatt Earp, three of the most famous individuals the Wild West produced. Shortly after reading this post yesterday morning, I was at a school here in town and a man walked out of a door and he caught my attention. On his T-shirt was a large, forked trident. I asked him what it meant and he said "Navy Seals." Curious. Also, regarding the Amtrak train ... last Wednesday I was in Dougherty, Oklahoma, doing research, when I stopped and suddenly saw an Amtrak train zip by. It was the "Heartland Flyer" heading to Fort Worth, Texas. It reminded me of a time about 15 years ago when I was a reporter in rural Louisiana and crossed a RR crossing at night, only to notice a train passing by in my rearview mirror. I hadn't even noticed it. I was thinking of this just a few days before this awful tragedy in Trinidad. (P.S. - and the name "Steve Miller," as in the musician, has been coming up a bit lately. His 1982 hit "Abracadabra" is my my favorite. Looking at the first photo, I find it quite remarkable that the bearing from the RR Crossing to Fisher's Peak is due South with a deviation of less than 2 degrees! (Accuracy = 0.92%)Well, what is a bearing of 180 anywhere on earth? It is moving South along a line of Longitude! So let's continue South along this Longitude line. How far? Well, the title of this posting is Trinidad 33. So let's keep it going until we cross a Latitude line of 33° down to 32°. Hello! Welcome to Roswell, NM! At this point, rather than hunt for out the probable coordinates of the UFO crash site, I turned to a late great researcher of Fortean phenomena, David Flynn, who gives the coordinates of the UFO crash site, NE of Roswell as +33.28,-104.56 in this article. Of course we already know that, but wait till you see what Trinity Trinidad means geographically! In creating a more accurate Longitude line between 2 points, you can take the mid-point longitude which is simply averaging the longitudes of the 2 points. And then I was inspired. What if I were to make a big circle on the map with its center at the Trinidad Crash site, having a radius of 272 miles (with an uncertainty of +/-0.67% , that is +/-2 miles)? What might fall within this narrow band of 270 to 274 miles radius? It lies at a radial distance of 270 miles from Trinidad, CO with a heading of 204.87° = 24.87° W of due South. Many tourists visit this god-forsaken site in the New Mexican desert. Trinity was the code name of the first detonation of a nuclear weapon, conducted by the United States Army on July 16, 1945, as part of the Manhattan Project. Thanks, New Day! Since I was born literally a “year and a day” after Loren (07/12/1947 --- 07/13/1948), then I intuitively trust his uncanny Cancer Crab intuition about whatever he posts, even if it seems at first glance to have no relevance. At first I was put off by the gruesome reality of that young family being annihilated, feeling almost like a ghoul intruding into their sudden deaths, but then my mood shifted into a calm resolve to find some significance to their deaths by using Loren's methodology of studying the names of places and mapping them. And indeed it was the synchropinquity of the Trinidad accident site and Fisher's Peak, making an actual longitude line that launched my whole analysis that led through Roswell to the Trinity A-bomb site. But wait, there's more! Just 64 miles due Northwest of the Trinity atom-bomb site, I noticed the Cibola National Forest. Using the pin that Google Maps provided for that location, I found the distance from the Trinidad RR crossing to that pin to be 264 miles. Pretty close to my Trinidad-Roswell radius of 272 miles. But now let's focus on the name. What is Cibola? Spanish for female bison. What is the word for male bison or bull? Cibolo. This should ring a Twilight bell! Where have we seen Cibolo before? Let's go back about 5 months to Loren's posting about the death of Justice Antonin Scalia just 33 miles from Marfa, TX. Where did Scalia die? At the Cibolo Creek Ranch. What are the coordinates of that ranch? Tom, I got chills reading your comment! Hello New Day! You think YOU got chills! You should have seen me when I was discovering this stuff! I was shuddering from “chill bumps” (Texas expression) and it was 102° F here in the San Fernando Valley! There are more shudders for you coming because of what I have discovered with the Latitudes, but that's not ready yet. Right now, I'd like to focus on the Trinidad crash site and its immediate surroundings. What's very odd here is that County Road 32 ends on the tracks because the other side looks like a driveway for someone's ranch. There is no public road on the other side of the RR crossing. I had assumed, like for most train-car accidents that the car was racing along a public road which would continue on the other side of the tracks. Next thing to notice is that County Road 32 is only a half mile long! Its Western end is a T onto a N-S County Road. But notice the name of the township (or whatever you call it, incorporated area?) at that intersection. It's called “El Moro” and it has a zip code. What is El Moro? Spanish for “The Moor.” What is a Moor? The medieval name for a Muslim, though specifically back then, the blacks from North Africa. 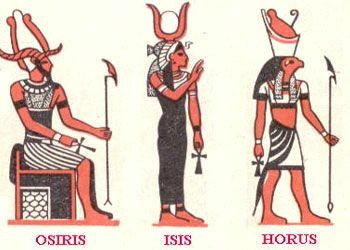 Best to investigate the history and etymology first. So the crash in Trinidad occurred somewhere between the Moor and Purgatory. The town of Trinidad is in the County of Las Animas (feminine plural noun) and that name has been puzzling me because Los Animos (masculine plural noun) can also mean "spirits" as in "high spirits" = emotions or moods. I would like to find an expert in the Spanish language to explain the differences between those 2 nouns. But in the meantime, the differentiation is once again that of gender. And this is like a second prodding to pay attention to gender here, because yesterday I discovered the Cibola National Forest and that led me to the Cibolo Creek Ranch in Texas where Justice Scalia died. Cibola = the female bison, cibolo = the male bison. So what is the gender issue with the Trinity? Don McLean sings of the 3 MEN he admires most, the Father, Son and Holy Ghost who took that last train for the coast the day the music died. Well, like Don, I was raised Roman Catholic in NYC, so I was taught by nuns and priests that the Trinity is male. 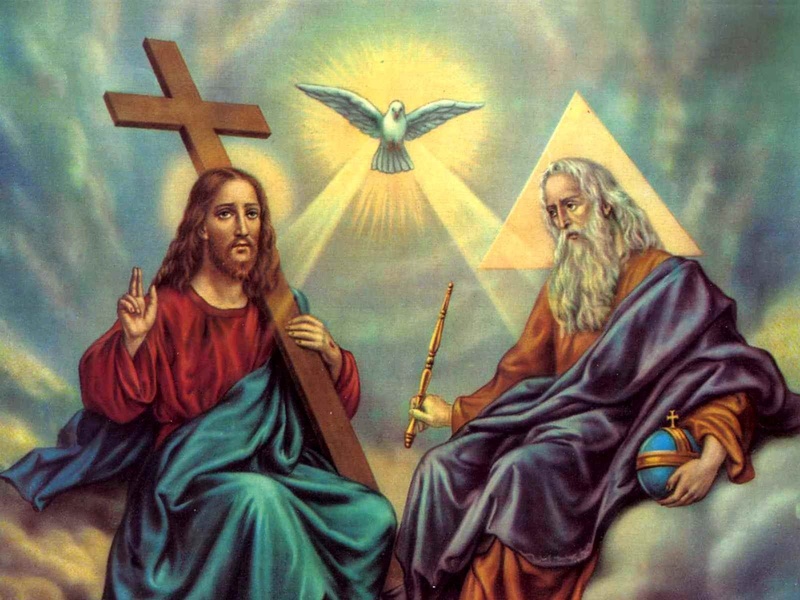 Is there any female connected with this Trinity? Well, the Son had a Mother, right? And she be the Blessed Virgin Mary, Mother of God the Son. She was very special with her own Immaculate Conception and her Assumption into heaven instead of dying. The closest we Catholics would get to Goddess worship. OK, but, a decade ago, I read the daVinci Code and there's another Mary in the Catholic faith, but she is quite, shall I say --- earthly --- compared to the other --- heavenly --- Mary. Who do I mean? You know who, but let's better find her now on Google Maps. The nearest town is about 11-12 miles SE down Route 169. It's called . . . Magdalena. Just heard from a native Spanish speaker who told me that Loren has it right. Las animas are the souls in Purgatory. Notice how at the station you are squeezed between the Purgatory River and the freeway IH 25. Notice how one of the names of the freeway is the John F. Kennedy Memorial Highway. Yes, there is a connection with the JFK assassination when looking at the latitudes. Just as Marfa, Texas is known for its "strange lights" (and near where Justice Scalia died), this area is not far from an area (San Luis Valley) known for its "strange lights." And between Canon City and Hooper, Colorado (home of the UFO Watchtower - http://www.reddirtreport.com/red-dirt-grit/colorados-ufo-watchtower-great-spot-spy-sky-saucers) are the Sangre de Christo Mountains, home of the obelisk-like Crestone Needle.